Charlie Gracie was the first Philadelphia native to break out nationally and internationally at the start of the Rock 'n' Roll Era. His early hits on the Cameo label (later Cameo-Parkway), launched the "Philly Sound." Today he is one of a diminishing number of Rock 'n' Roll innovators who remains active - performing on stages both in the U.S. and throughout Europe. Born in South Philly, Charlie was raised off the corner of 8th and Pierce Streets. Urged by his father, he took-up the guitar at the age of 10 and showed considerable prowess on the instrument by the time he reached his teens. Charlie's early influences included, Louis Jordan, Louis Prima, Big Joe Turner - and guitarists Arthur Smith and Danny Cedrone. In 1951, Charlie began his recording career with a New York label (Cadillac), later switching to a Philly-based company (20th Century/Gotham), experimenting with R&B and country-boogie, which later became known as rockabilly. This was still a few years before Elvis Presley, Buddy Holly and Jerry Lee Lewis had even gotten started! Meanwhile, Charlie was building a regional reputation, appearing on several local TV and radio programs such as, the Paul Whiteman Teen Club on WFIL and the Circus Big Top on WCAU. Bernie Lowe, who arranged and played piano for the Whiteman Orchestra, was impressed with Charlie's talent, and their paths would soon cross again. In late 1956, Charlie was contacted by Bernie Lowe, who had just founded Philly's new Cameo Record label (later Cameo-Parkway) and by March of 1957, their first release, "Butterfly," topped the national Billboard Charts, selling well over three million copies worldwide. Charlie followed with "Ninety-Nine Ways," "Fabulous," "Wanderin' Eyes," "I Love You So Much It Hurts" and "Cool Baby," all of which charted, either in the U.S. or in the United Kingdom in 1957 and '58. These hits bankrolled the Cameo label, enabling it to sign a dozen successful artists - and it would become the largest independent record label in the country, by the early 1960s! At the apex of his career, Charlie frequently appeared on "American Bandstand," the "Ed Sullivan Show," Alan Freed's Rock 'n' Roll shows at the Brooklyn Paramount, the 500 Club in Atlantic City and even old Connie Mack Stadium in Philly. He became the first Solo American Rocker to tour the United Kingdom, where he headlined at London's Hippodrome and Palladium in 1957 and '58. Charlie continues to perform in the British Isles annually, where he is still loved and respected the length and breadth of the United Kingdom. He was voted into the British Rock Hall of Fame sponsored by the U.K.'s "Now Dig This" Magazine (1998). 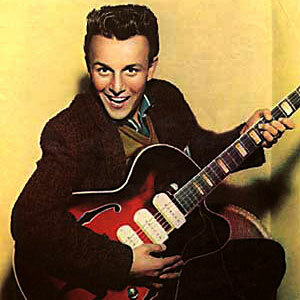 He was later inducted into the Rockabilly Hall of Fame (2001) and onto the Philadelphia Walk of Fame (2008). Charlie is acknowledged as a vital early inspiration by many Rock Heroes including the late George Harrison, who called Charlie's guitar technique, "brilliant" (Billboard, March, 1996), Paul McCartney, who covered Charlie's "Fabulous" (2000); Graham Nash, who contributed vocals on Charlie's last CD (2005) and Van Morrison, who asked Charlie open for him at several West Coast concerts. Those artists and others including, Peter Noone and Albert Lee praised him in the made-for-PBS, TV documentary: "Charlie Gracie: Fabulous!" (2007). All expressed reverence for the slick, raw power that Charlie brings out of his trademark Guild hollow-body electric. Now in his mid-70s, Charlie is grateful for a lifelong career in music. He is a devoted family man who this year (2011) celebrated 53-years of marriage to his South Philly sweetheart, Joan. Charlie also venerates the memory of his parents who gave him an appreciation for a wide variety of music and an opportunity to pursue a career in the entertainment business. He takes great pride in his hometown and continues to be a great musical ambassador for the City of Philadelphia - performing each year in such far flung places at Finland, Germany, Italy, France, Holland Belgium and Switzerland. In 2008, Charlie was invited to headline a new stage show at the Liverpool Empire entitled: "American Heroes," which paid tribute to American rock 'n' roll musicians. The city also honored him for his important influence on their native sons: The Beatles! Charlie is currently writing a memoir of his six decades in the music business - and finds himself at the center of a new CD project with Al Kooper and several of the British Invasion artists he inspired, including: Graham Nash and Peter Noone. "When all is said and done... I'm still little Charlie Gracie from South Philly who sings and plays the guitar. If you ever came to see me perform - and you found yourself entertained - and I made you happy for a few hours, then I've fulfilled my mission in this life. I'm eternally grateful to God for that opportunity!"